Paula has been transforming clients brows, eyes, and lips with her skillful application of semi-permanent make-up for many years, recently moving away from her salon Define hair and beauty she has a private treatment room in Maidenhead Berkshire, sparse uneven brows can be given a whole new look that will make you feel more confident and glamorous, using either a hair stroke or powdered brow effect, semi-permanent eyeliner can be applied as fine or as thick, even with a Latino flick! Lips made to look more youthful and uneven lip line corrected and enhanced, you will be thrilled with the results and amazed at the ease of the treatments. 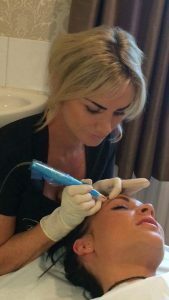 “Many people have sparse, uneven eyebrows, which I can transform into thicker evenly placed ones, giving the effect of an “eye lift”. We all know what a nightmare it is to apply eyeliner, only to have it smudge in no time at all! With the application of semi-permanent make-up, lashes will appear thicker, eyes wider, the effect can be as subtle or dramatic as you like, but either way eyes will appear more youthful, and it won’t smudge!